In 2013 while traveling to Thailand, Minh saw driftwood horses and deers displaying during Christmas time. He was fascinated by the beauty and artistic composure of these creations which sparked his interest to create something from pieces of driftwood. Minh is a renaissance man. Minh discovered his artistic side late in life. After 11 years working for a biotech company as a biochemist, Minh moved to Monte Rio from San Francisco, California in 2013 to work on his nursing and massage therapy licenses. Living about 8 miles from the Sonoma Coast, Minh found his “treasures” of driftwood along the coast. He began to collect them as he took his dog Bradley for a run on the beach weekly. He saw the natural formations from the driftwood pieces and began to compose into art work as a hobby. 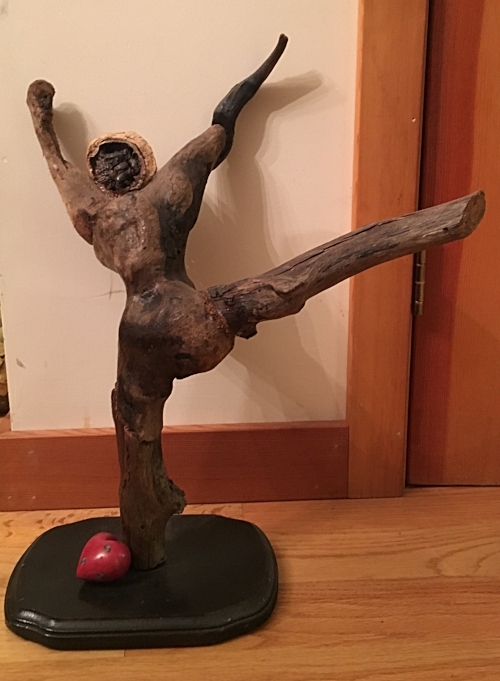 Initially, he used hot glue stick and nails, modified some of the driftwood pieces, and resurrected them into “living” small animals like birds and turtles and abstract human figures. Some of his works had been shown several times at the library art and local galleries in Guerneville, CA in 2015 and 2016. Minh has no formal artistic training, but is a self-thought artist. His work has evolved as he figured out better ways to connect the wood together from techniques to scales, and from abstract to more concrete pieces. Some of the works have been shown at the Occidental Center For the Arts, a local gallery. He has continued to collect more driftwood pieces and wanted to challenge himself with more complex work. He desires to show his work to a large audience and meets other driftwood artists in the future. On his regular schedule, Minh is working part time as a private nurse and a massage therapist. Minh's first piece of work, The Dancer. The woods had been modified to fit the desired outcome. What inspired him in this work is that the shape of the wood looks like a human body. The spread of the leg and the extension of the arms reflect a dance movement of a human figure into the air.